Ideal for those who dream of having their meals or reading good books facing the sea. What can differentiate it from others is the 180 ° panoramic view of the sea. Facing a long sandy beach. Put on your swimsuit, you're already in the water ... And for the walkers, the GR goes to the foot exceptionally preserved ... A paradise for bathers, dreamers and hikers! A nice little cozy nest with all the comforts necessary to rest and breathe the good air iodine of Brittany in a very quiet and well preserved. Like all the other gites, it has all the usual comforts of home appliances (TV, coffee maker and electric kettle, toaster, microwave washing machine, dishwasher, iron ...), not to mention its pretty contemporary decor thought for us ... and so for you! 1 bedroom, 1 bathroom, 1 toilet. 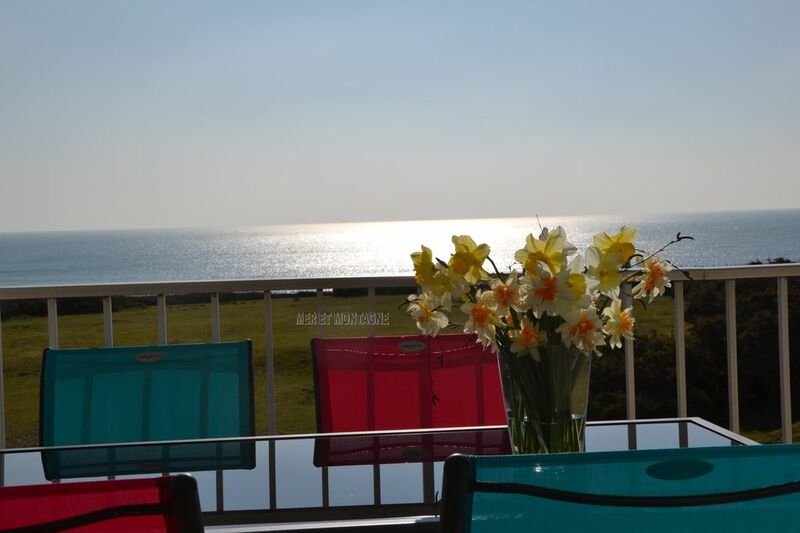 Kitchen, dining room, beautiful terrace with a magnificent sea view and Ile de Groix. Possibility of cleaning at your expense departure.
. The lawn, without vis-à-vis with sea view, structured by the massifs, the paths will make you discover the heated swimming pool, is at your disposal from July 1 to September 15. You can swim in any weather. Also available for free the tennis court. Hiking is possible from the rental (no need to take the car). Internet access with a public wifi terminal at the tourist office. Nous sommes ravis de notre séjour beau et très chaud. Le ciel est bleu la vue magnifique,la chaleur est moins étouffante sur Paris et la piscine est agréable. Environnement splendide .Une location très agréable avec une vue à couper le souffle! Nous avons pris les repas du soir sur la terrasse tellement qu'il faisait beau. Merci beaucoup. Le chèque de caution de 300 € sera à remettre le jour de l’arrivé. Notre maison est loué en parfait état de propreté. Entretenu par nous même et notre dame de ménage.